Whatever your opinion of Obama and Romney, one thing is clear following Obama’s re-election as US President: we may breathe easily insofar as Romney’s potentially disastrous approach to foreign affairs will not now be realised. The Cold War will not be reanimated. Romney posed as a patriot, and yet he had been instrumental in the mass offshoring of US jobs; he presented himself as the international strongman, advocating significant increases in defence spending, whilst undermining the US economic base through his promotion of globalism and domestic deindustrialisation. 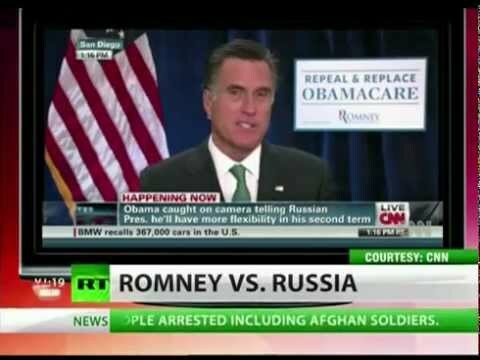 Romney either lacked the intellectual capacity to recognise that Russia is not the US’s “main foe”, or cynically used Russia as a convenient bogey, attempting to whip up a pointless Russophobia as a means of harnessing the sense of domestic disquiet over the US’s geopolitical decline. Mitt Romney has failed in his presidential challenge. The nations of Europe will be safer as a consequence. You ignore 2 things: The Islamic threat and the fact that Obama has absorbed Marxist ideas line and sinker! Obama either is naive or complicit or actively promoting and abetting these threats to America and consequently to Europe and the entire free world. Thanks God the Republicans won the House of Representatives. A retired Catholic priest from Canada. Does what you have written negate any of the observations made in the piece above with respect to Romney's apparent hypocrisy expressed in his cod patriotism and his delusional stance towards Russia?